Within a data centre environment protection of the critical power path is vital to the 24/7 operation of the facility. Whilst the purchase of an uninterruptible power supply system will often be treated as a CAPEX investment, subsequent ongoing service, maintenance and battery replacement costs are typically covered by OPEX budgets. As part of an OPEX budget, battery management can quite easily be considered for outsourcing potential as a managed service. Critical Power as a Service (C-Pass) was launched by EcoPowerSupplies to provide data centre operators with the ability to outsource their entire critical power provision. Within this we also offer ‘Batteries as a Service’ as a separately managed service. For data centres choosing this option, cost savings and enhanced battery warranties, are available as part of a ‘turn-key’ to on-site UPS battery management. Battery monitoring: with individual battery block monitoring (ambient temperature and DC voltage) and on-site or Cloud-based reporting over an IP network. 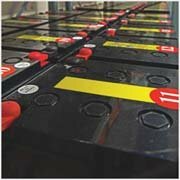 Individual battery block inspection and testing: as part of an annual or bi-annual preventative maintenance visit with testing as required using an advanced hand-held battery tester for each block (conductance and impedance) and the storage of results for comparison and trend analysis. Extended battery warranty: with up to 5 years or a 10 year warranty from a battery manufacturer with a known history and track record in critical power installations. Competitive pricing: for the UPS battery set, battery monitoring and on-site services. Leasing facilities: in the form of the Critical Power as a Service (C-Paas) contracts offered by EcoPowerSupplies. Offering UPS batteries as a managed service contract makes sense for data centres. It reduces overhead on their own facility services and places management and responsibility of the ‘fuel’ source with a UPS battery specialist company. Of course any contract would be subject to a stringent Service Level Agreement (SLA) with binding terms and penalties for non-delivery of service. Coupled with a five or ten year comprehensive battery warranty, a ‘Batteries as a Service’ contract could also help to protect against early battery failure costs. The costs of future battery replacement, including battery installation and recycling could also be built-into the contract. Data centres are constantly being driven to look towards the future, whether in terms of IT supporting their primary functions or their approach to critical power and cooling infrastructure. Outsourcing battery management as a service could be an innovative, cost-saving solution for data centres and one that becomes even more appealing with energy storage systems and Smart Grids on the horizon.